Here's a better side-by-side comparison. It seems pretty obvious that she's had her nose done. But she had it done early in her career and it looks really good, though I think her old nose was perfectly fine. 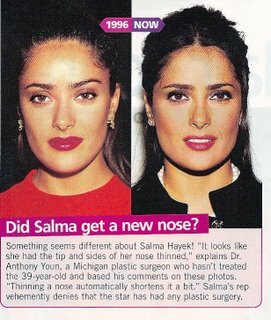 I would like to know who did salma hayek's and Angelina Jolie's rhinoplasty. My nose is similar to these 2 and the surgeon did an excellent job. How can I find the names of their plastic surgeons. Very difficult. Quote - "Now if she could only do something with that homely boyfriend of hers!" Hello! I love your blog ans I was wondering what exactly "ethnic rhinoplasty" was. I've always been curious if people with thicker noses (african american/asian/latin etc) where able to get that "staple" caucasian nose like Nicole Kidman's without looking like Michael Jackson. SHE DIDN'T DO ANY PLASTIC SURGERY!